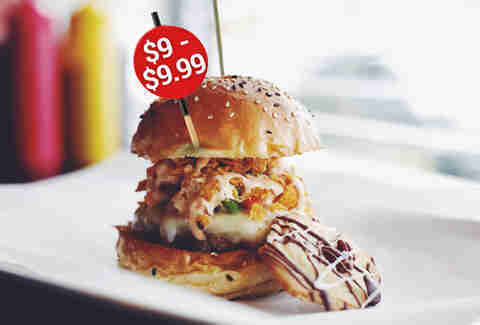 Whether you're living like a ramen-diet student or a Playpen lifer, you deserve the best burger that money can buy. 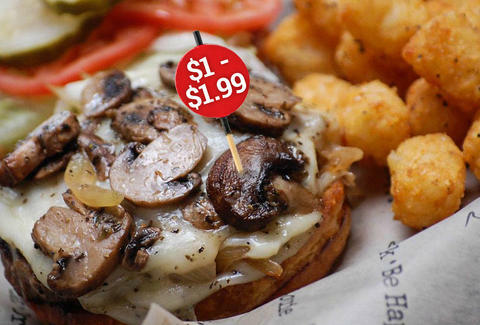 So we're giving it to you: here's a rundown of the best Chicago burger for 22 different price points (starting at $1). 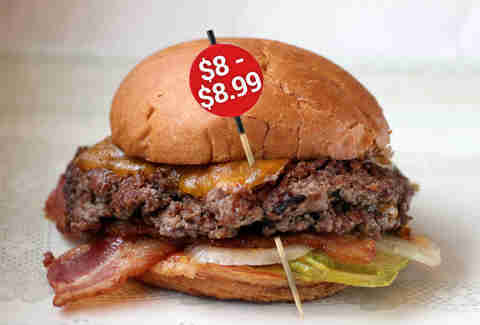 Now go get the best burger bang for your buck. 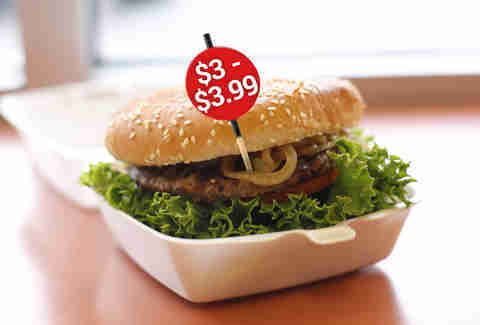 Every Tuesday, the hamburger special (available from 5pm to close) gives you a meat patty, lettuce, and a bun (toppings and tots cost extra, but still, not bad for a buck). 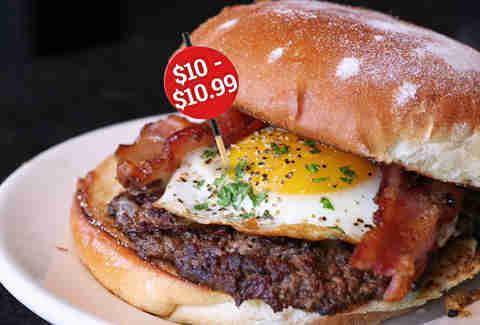 Of the $1 burgers floating around various sports bars, Bar Louie provides the strongest base from which to work. 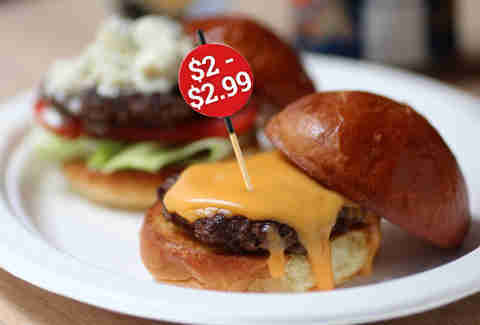 There’s a litany of slider options at Henry’s and for less than $3 you can get any slider with typical burger toppings or Merkt’s cheddar, soon to be chased with a Malort/Old Style boilermaker. 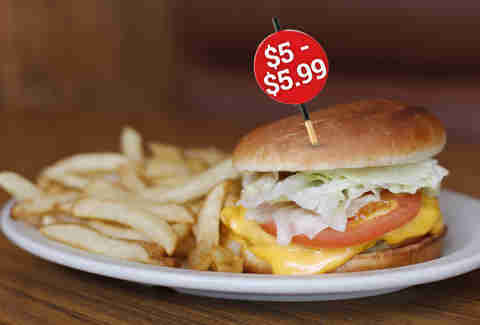 Choppers' quarter-pound char-broiled burger is packaged Whopper-style with lettuce, tomato, grilled onions, mustard, ketchup, and mayo on a toasted bun. In addition to Polish and Depression dogs, this respected hot dog stand offers a griddled double cheeseburger WITH fries for under five bucks. Top Notch is no misnomer, especially when you have Beverly’s tastiest cheeseburger, ground daily and griddling in its own juices, on your hands. 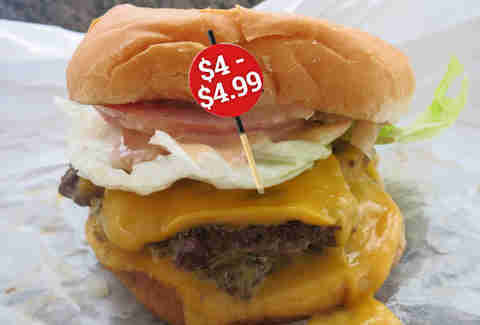 The stacked patties of the Double Fatso with cheese are not to be missed at this unashamed fast-food spot. Pretty soon you’ll get to sample their wares in the former home of Hot Doug’s. Come to this standing-room-only burger shop to channel your inner Champ Kind with the Whammy Burger, topped with a whole Polish sausage. 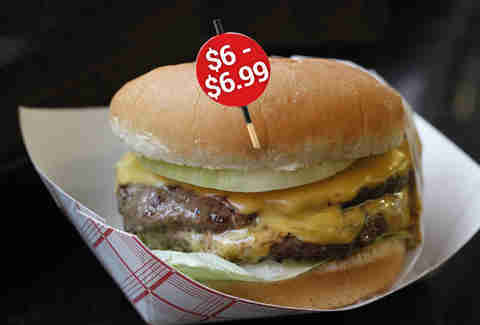 We could have easily plugged in Edzo’s almost anywhere on the list with great burgers on the cheap. 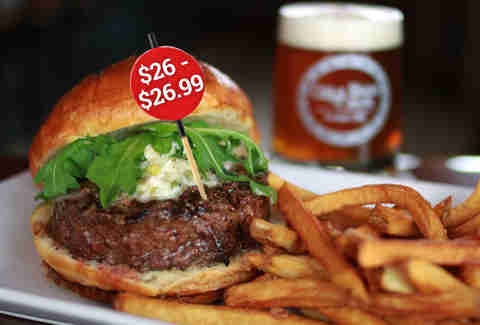 But since there're also plenty of upgrades on the menu to soup up your sandwich (and some of them are crazy good), we put it here: spring for the Slagel Farms beef burger with some added bacon. Among a lineup of rock n' roll-themed burgers, the Midnight Special stands out with a fine coating of chili cheese Fritos, pico de gallo, and chipotle cream. 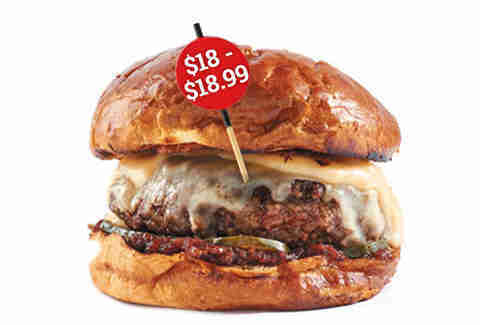 For around $10, you can take your pick of most any burger on the DMK menu, ranging from a roasted green hatch chile and bacon burger to a smoked Swiss patty melt. The single cheeseburger (which is actually a double burger) at Brendan Sodikoff's uber-cool greasy spoon is the best around, even if you scrimp on the thick-cut pepper bacon and fried egg. You won't be viewed as a heretic for ordering a burger in one of Chicago's top steakhouses, especially when it's the 40-day dry-aged prime steak burger complete with crispy shallots and bacon mayonnaise. You'll find it on the bar and lunch menus. 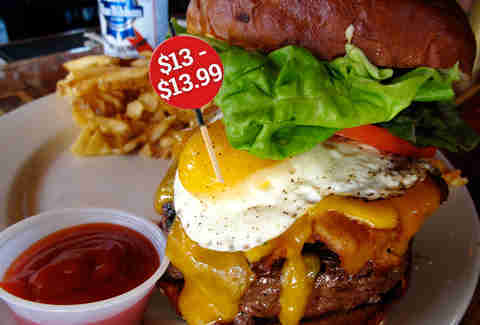 This metal bar offers 25+ burgers with unique ingredient combos you won't find elsewhere, but you have to start with the signature Kuma Burger with lettuce, tomato, bacon, egg, and beef, all on a durable pretzel bun. Saddle up to the bar to get your mitts on a Trench Double Burger, topped with aged Tillamook cheddar and bread & butter pickles on a fluffy, toasted sesame bun. 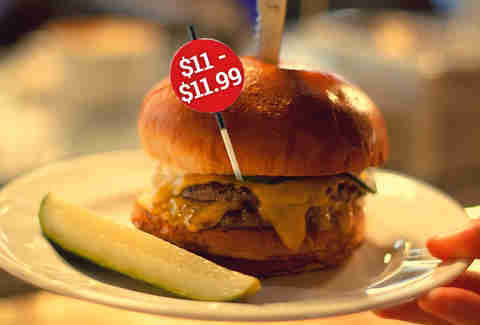 Save a few ducats by looking out for their rotating $10 burger-and-beer specials on Wednesdays. 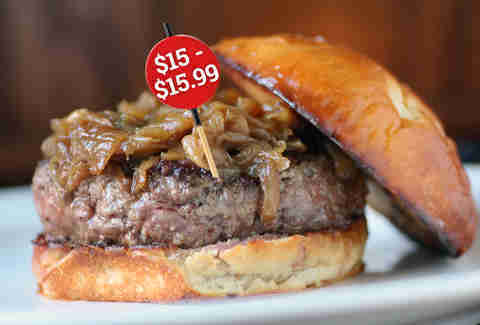 The British-style pub's Slagel Farm beef burger -- a combo of caramelized onions and a flavorful brisket/short rib/chuck patty on a potato bap -- isn't just tops in Chicago, it's among the nation's elite. Satisfaction on a ciabatta roll, Nightwood's cheeseburger makes it with two patties, eight-year cheddar, an onion ring, pickles, special sauce, and homemade Worcestershire sauce. 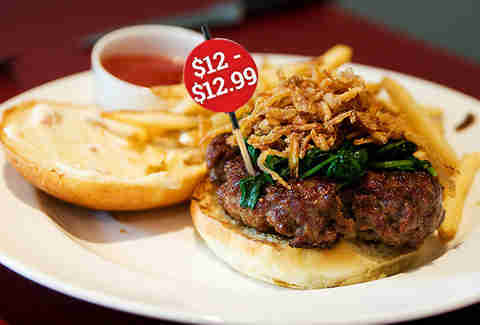 Indulge in Chef Kevin Hickey's wood-grilled ground bacon burger with a 70:30 beef-to-bacon ratio (!!! 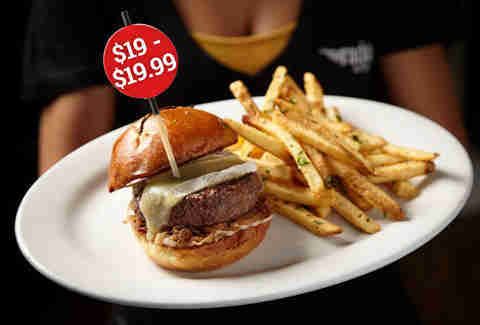 ), creamy Vermillion blue cheese, shoestring potatoes, and special sauce on a buttered brioche bun. If prix fixes and wine pairings aren't your thing, the bar menu affords an excellent alternative with the Acadia Burger, a juicy brisket and Wagyu patty, Gruyère, Mornay sauce, and bacon-onion jam for maximum umami-ness. 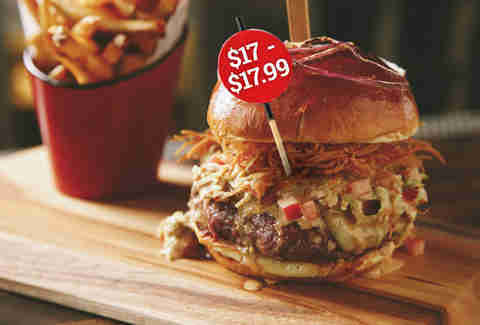 Max out your Andrew Jackson at Billy Dec's burger bar by ordering up a Rockit Burger: Wagyu Kobe beef, melted Brie, fried shallots, and medjool date aioli on a red onion brioche bun. 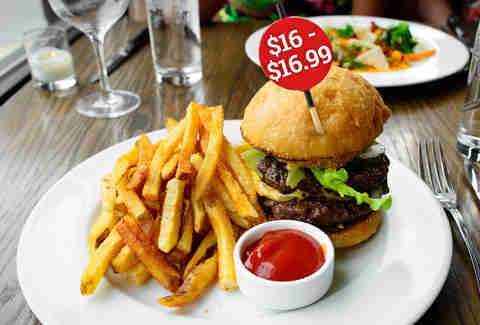 Truffle fries on the side? Totally included. 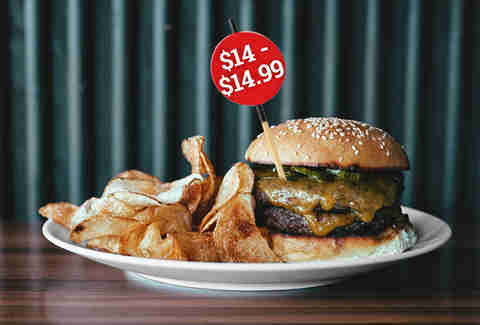 Though it seems entirely illogical to spend more than $20 on a burger, it you are feeling particularly swaggy, you've got a couple options: the Road House BBQ Burger at Tavern at the Park ($21), the special Wagyu Wednesday Burger at The Bad Apple ($26), or the foie gras truffle goat cheese burger at Rosebud Steakhouse ($30). Sean Cooley is Thrillist's Chicago Editor and he plans to work the word "umami" into as many casual conversations as possible. Follow him @SeanCooley.